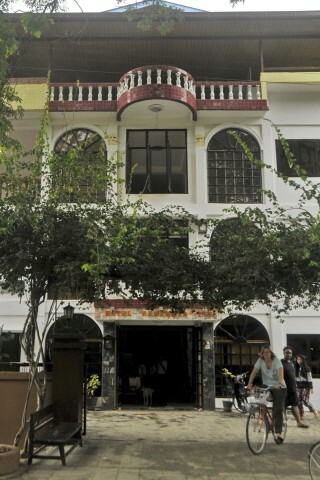 A reasonable location, great rooms, friendly service and exceptional rates make Remember Inn our favourite in Nyaung Shwe. Ad Book now! Rates from US$12.12++. Average rating 8.1 from 248 reviews. Prices may look fairly standard, but rooms are well above average – and there are no high season supplements. The location on Museum Street, directly opposite the museum itself, is a bit of a hike from the jetties, but it’s just a short walk to the market and most eating and drinking areas. This is also one of the quieter parts of town. The large guesthouse is set in a spacious compound set back slightly from the road and comprises a four-storey white painted building, which has their fan rooms, and a series of one-storey bungalow-style, air-con rooms. Much of the ground floor is given over to reception and staff areas, and the top floor is a rooftop cafe. The cheaper but spacious fan rooms all have views and some come with small balconies as well as ensuite bathrooms. They are perhaps the best-looking $20 rooms we saw in town, with restrained but attractive decor, freshly painted walls and some fine dark-varnished furniture. The beds themselves are worthy of a four-star resort. Bathrooms aren’t a highlight but they do come with hot water. The bungalow-style, equally well laid out air-con rooms are more spacious and the bathrooms are newer or at least more recently renovated. Since the fan rooms are already large and the air-con ones don’t have views, we’d suggest trying to grab one of the upper floor fan rooms with balcony. They did also have a few air-con rooms in the main block, but these were full when we visited. WiFi is no better than anywhere else but we did find the management helpful and plenty of local information is on display, too. Breakfast gets good reports and the view from the rooftop eating area is excellent. All in all, this is a top spot representing exceptional value. Check rates at Remember Inn on Booking.com.